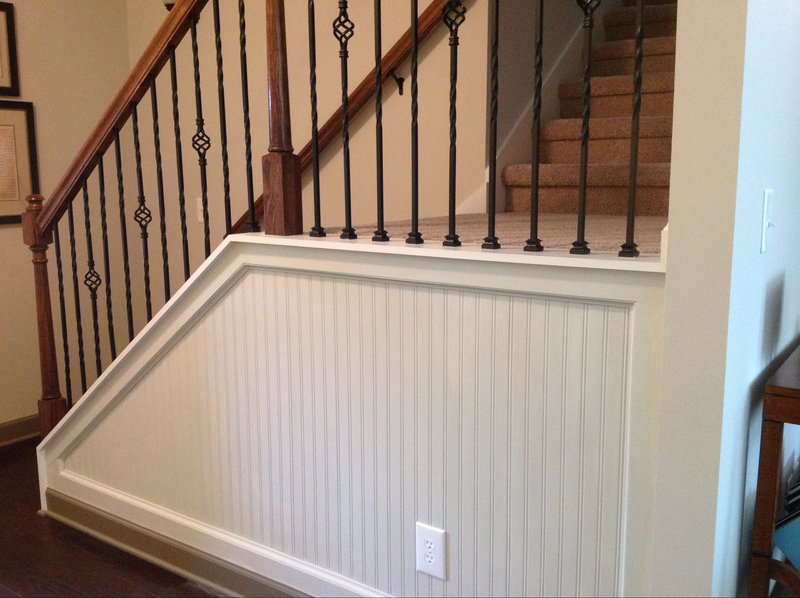 I just finished a project that evolved from a change to this foyer…installing bead board panels under the stair landing. Because of the thickness of the bead board, I decided to remove the existing drywall because if I’d just installed on top of it, then the extra thickness of the wall would have pushed the baseboard out of line with the surrounding base on the other walls. So once I removed the old drywall, I gained access to the space under the landing and could see that it went all the way back along a long wall and directly backed a coat closet in the back hallway. I decided to capture that space and gain an extra 25 sq.ft. of storage for seasonal things, old luggage, and other things that we rarely use but don’t want to throw away. Some of the changes involved installing a new outlet on the beadboard, moving a clunky media box out of the coat closet and into the new storage space, installing an LED fixture in the new space, adding a new outlet in the coat closet for TV components, adding 2 new CAT6 data lines from the closet into the living area for future use. I found some vinyl tiles to match the flooring in the back hallway and also drywalled the storage spaces to help keep dust and spiders out.